While every story doesn’t need a love interest, they are always interesting when one finds one. In the case of airship NS11 this is provided by Pansy Nina Grahame Chambers, together with a fair dose of intrigue, unsolved questions and an astonishing coincidence. Born in Holywood, Dunfriesshire, Scotland in 1898, Pansy’s parents were Major William Graham Chambers (formerly William Goulay Dunn and from a famous golfing family) and Nina Grace Chambers (the publishing family). By the time she was three, Pansy and her parents were living at Glenbrittle Lodge, Minginish on the Isle of Skye. The family travelled to Canada in 1911, living on Vancouver Island, before returning to London in 1915. Pansy had three brothers, Robert Laing Chambers (a trooper of the 1st Australian Light Horse who was killed in action at Gallipoli on 18 May 1915) and Murray Goulay Chambers, and a sister, Nina Iris Grahame Chambers. The engagement is announced of WALTER KEMEYS FRANCIS GOODALL WARNEFORD, Flight Commander, R.N.A.S.. son of Mr. and Mrs. Walter Warneford, of Lansdowne House, Huyton, Lancs, to PANSY GRAHAME CHAMBERS, daughter of captain W. Graham Chambers, late Gordon Highlanders, Canada, now Lieutenant-Commander, R.N., and of Ardmay, Arrocha. Walter and Pansy didn’t marry. On 15 July 1919, however, the very day NS11 was lost and Walter Warneford and his crew were killed, Pansy married Patrick Gream Nelson Ommanney at the Holy Trinity Church, Brompton, London. At the time of the marriage Patrick was a Major in the RAF, ex-Lieutenant, RN and former commander of the rigid airship R27. The airship flew 89 hours 40 minutes under Ommanney’s command, but came to a disastrous end when she was destroyed by fire together with SSZ.38 and SSZ.54 on 16th August 1918. Patrick was son of the highly-regarded RN Rear Admiral, Sir Robert Nelson Ommanney. Sir Robert was appointed a Knight Commander of the Military Division of the Most Excellent Order of the British Empire (K.B.E.) on 1 January, 1919. All this might be significant as Patrick would certainly make a ‘better match’ for Pansy than Walter Warneford, son of a railway engineer. Significantly, also at the church that the day of Pansy and Patrick’s wedding was Edward M. Maitland, Brigadier General of the RAF and head of the airship service who had returned from the USA to Pulham aboard R34 just two days before. His signature is written on the margin of the wedding certificate. There is no doubt that NS11’s commander on the night she was lost was well aware that the girl he was engaged to, announced a little more than a year and a half before, was to be married to another man that day. Whether this has any significance, or is just an incredible coincidence, will probably never be known. Something of an inventor, Pansy’s new husband, Patrick Ommanmey is granted a patent on 5 May 1920 for an “instrument for facilitating calculations depending on the relations between the pressures, densities, temperatures and percentage compositions of gases, and the recording of observations of these quantities.” It then looks like Patrick spends most of the 1920s travelling back and forth to the USA, as first a journalist and then as a merchant (possibly for tea and coffee). They watch us on our ways. The winds hiss through our wires. We somehow seem to know. Slid back across the sky. 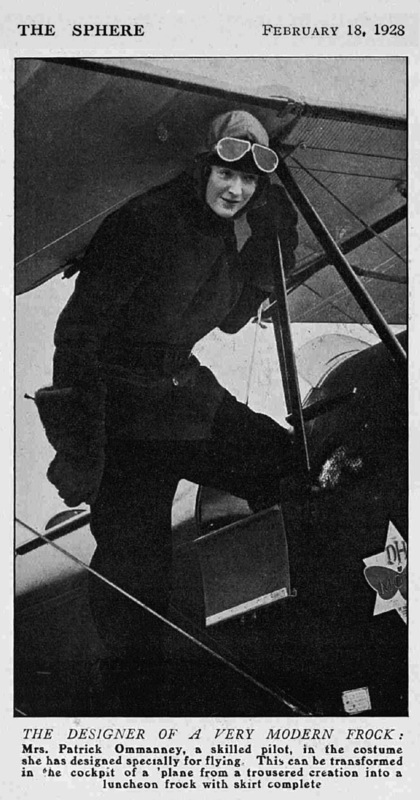 Mrs Patrick Ommanney, a skilled pilot, in the costume she has designed specially for flying. This can be transformed in the cockpit of a ‘plane from a trousered creation into a luncheon frock with skirt complete. 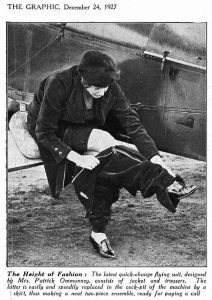 A novel quick-change flying suit, designed by Mrs. Patrick Ommanney, in a dark blue cord, which enables the wearer to perform a quick-change in the cockpit of the airplane while flying, and so be ready to take part in any social function, etc., on landing. Mrs. Ommanney is here seen in her quick-change suit, standing by her airplane ready for flight. Mrs. Pansy Ommanney, poetess, explorer, and dress designer. As a dress designer she is making an international reputation, and her frocks are being worn by the smartest people. In 1929 Pansy and Patrick divorce. Notice is hereby given that on the 29th day of August, 1930, PANSY NINA GRACE Chambers, of 118 Park-street, in the county of London, heretofore since the date of her marriage with Patrick Gream Nelson Ommanney, called and known by her name of Pansy Nina Grace Ommanney, renounced and abandoned the use of her said surname of Ommanney and resumed her maiden name of Chambers; and further that such change of name is evidenced by a deed dated 29th of August, 1930, duly executed by her, and attested and enrolled in the Enrolment Department of the central Office of the Royal Courts of Justice on the 8th day of September, 1930. dated the 8th day of September, 1930. GORDON DADDS and CO, 11-12, St James’-place, London, S.W.1. 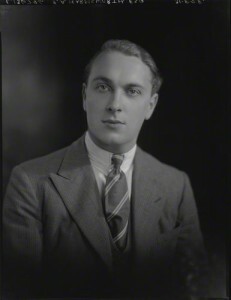 At St. Giles Church, Edinburgh on 8 December 1930 Pansy married Perceval Anthony Thomas Hildebrand Harmsworth son of Sir Hildebrand Aubrey Harmsworth. In August 1939 Pansy had an article on canal cruising published in Chambers Journal. 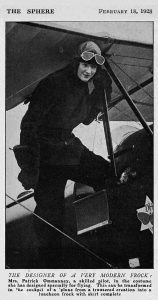 She wrote and broadcasted throughout the war and was given facilities as Air Correspondent by the Air Ministry. In this petition Mr. Philip Henry George Gosse, of Hills Road, Cambridge, sought the dissolution of his marriage with Mrs Irene Ruth Gosse on the ground of her adultery at Earl’s Terrace, Kensington, with Mr Perceval Antony Thomas Hildebrand Harmsworth, against whom the petitioner claimed damages. (£250 ordered to be paid within 14 days). The Times. 23 July 1941. Notice is hereby given that IRENE RUTH GOSSE of Weppons, Steyning in the county of Sussex a natural born British subject, intends after the expiration of twenty-one days from the date of publication of this notice to assume the surname of Harmsworth in lieu of and in substitution for her present surname of Gosse. Dated this 14th days of July 1942. Pansy and Perceval did divorce. Pansy continued to live at Kings Mead in Steyning, Sussex until late 1949, at which time she moved to Jamaica to teach art. She left Jamaica for Le Harvre, France in 1951 and moved to Guernsey. In 1959 Pansy married Lieut Colonel George Hornung. A son of the Africa pioneer, sugar planter, businessman and horse breeder ‘Pitt’ Horning, George was wounded during the Great War, and subsequently commanded the Horsham Battalion of the Home Guard during the Second World War. 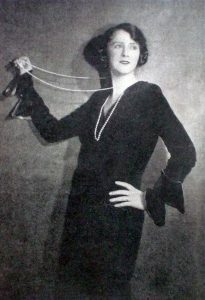 Pansy died in Guernsey on 17 April 1975. And of these three I weave romances. Many thanks to Deb Fitzpatrick (Pansy was her great aunt), Teresa Stokes (Perceval Anthony Harmsworth’s cousin), Heather and David Henderson, Bernard Horning (George Horning was his great uncle) and David Tovey for providing invaluable detail on Pansy’s story.